What is So Great About these Giant Towers?! Can play for hours - keeping people entertained without the use of a television! Can be used inside too - wondering what to do for your nest Christmas party? The chunky blocks are difficult to lose - unlike the smaller version of the game however, if you are unfortunate to lose a block we do sell replacement blocks! Makes a great gift - looks huge in wrapping paper too! Which Tower Game will be Best for Me? Without trying to make you go for the most expensive one, we want to show you exactly what the differences are between each tower. So the names are confusing, and why is one more expensive than another? Here we try to explain all your burning questions! As the tower with the lowest price tag, what does this tower offer? 2. The wooden blocks are just as durable in the smaller game as the larger games - each block measures 150mm x 50mm x 30mm. 4. This version is the perfect gift or for those of you who really want a Giant Jenga style game but don't have the space to store one of the big versions. It even comes with a handy bag to pack the game away into. As the second lowest in price and size - what can this tower offer that the others can't? 4. We know so many people who have had this game for well over 10 years! 4. So solid and durable you may even end up passing this one onto your grandchildren! Remember, carry-bags or storage bags are available for all towers. 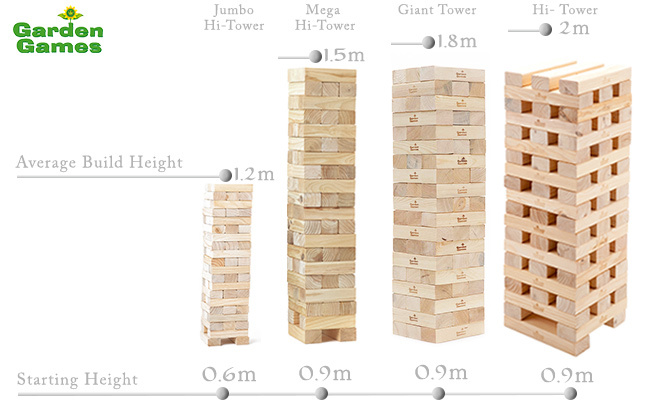 The picture below summarises the height of each Giant Tower, with measurements from the start to an average height during game play. This will give you an idea of which tower gives a game that will last the longest - although remember this is all down to player skill and the stability of the surface you are playing on!